Need help selecting the best conveyor system for your application? Dorner’s new Product Selector within its D-Tools program is just the answer. The new Product Selector is available on all of Dorner Tools (D-Tools) conveyor productivity applications, including its 2D and 3D CAD libraries, DConfig and Dpricer. This new feature is designed to help people select the best conveyor system for their application, and can be accessed by visiting www.dornerconveyors.com. 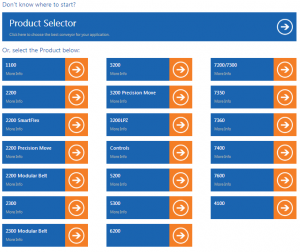 The Product Selector works by having people check off features and benefits that are important to them in their conveyor system relative to the application they’re specifying for. For example, people check mark about conveyor preferences on belts, timing, speed, width, corners, weight loads and environmental conditions. The list of conveyor options narrows as customers move through the list. When the Product Selector helps identify the right conveyor system for your application, you can go directly into DConfig to add dimensions and download a CAD drawing or request a quote. If the Product Selector identifies a conveyor system that’s not part of Dorner’s standard offering, it refers the user to fill out an Engineered Solution request. To access the Product Selector visit D-Tools.